An article that looks at how to take a naturalistic approach to landscaping around your pool with design ideas and advice on how to do it. A water feature in your garden. There are many people who would say that no garden is truly complete without a water feature and what better water feature could you add to your property than a swimming pool or a hot tub. Water reflects light, water moves and water can make the most entrancing sound. All these aspects make it very attractive to landscape architects and garden designers. Swimming pools and hot tubs can bring all those qualities to your garden with the addition of providing a focus of entertainment for your friends and family, a place to relax or exercise, the benefits of hydrotherapy or really just the simple joy of being able to immerse your body in water beneath the open sky. Designing a garden that contains a pool has some significant differences to designing one with a large pond. A pond can be surrounded or even overhung with trees and shrubs, a pond can have marginal planting that bridges the gap between the wet and the dry and a pond will not contain treated or chlorinated water. A swimming pool needs to be set in a landscape that will minimise the amount of leaves and other debris that will fall into the water. Even a pool with a salt water chlorine generator will not provide a good environment for most marginal plants. Some planting won’t even tolerate being near chlorine. The trick is to make the swimming pool look natural and at one with it’s landscaped setting while keeping the two separate and distinct. The shapes of free-form pools are naturally organic. Their flowing forms fit in with nature. Free-form pools are always unique and designed to fit in with each individual site and with the needs and aesthetics of each client. Where water appears in the natural environment, there are usually changes of level and these are good to replicate in the landscaping around your pool. The organic shape of your free-form pool can be mirrored and repeated in the decking around the pool, pathways and beds for planting. Slopes and terraces allow you to shelter the pool from prevailing weather, from a less than perfect view or from being overlooked by neighbours. When the pool is excavated there is going to be a large amount of top soil and sub soil dug out and this can be used to provide terracing and level changes even on what was originally a flat site. It’s a good idea to make sure that the contractor keeps topsoil and sub soil separate during the excavation so that it can be used appropriately during the landscaping. Keeping the excavated soil on-site also helps to reduce the costs of pool building. If the site you have available for your pool is sloping originally then this will mean more excavation and groundwork but it does also bring the opportunity to create a pool that nestles into a hillside and perhaps looks out over a spectacular view. Planning the landscaping around your pool. Whether you intend to use a landscape architect, your pool contractor’s skills or generate the design yourself, the first thing that needs to be done is that the site must be accurately surveyed. It’s possible to do this yourself but it is quite a challenge and any mistakes on the survey may well cause problems during the build. The survey generates a plan of the site, which is accurate, and to scale. If you want to come up with your own designs then get some copies made and simply sketch ideas onto the plan. Aside from the shape, size and position of major features such as the pool itself, perhaps a spa, the area of decking around the pool and any poolside buildings you have in mind there are other things to consider at this stage. Draw on the plan pathways and routes that people will take through the landscaping but also draw in what are called ‘sight lines’. Essentially, these are the views that you think will be most important in the area around your pool. They might be views from your house that will tempt people to explore down to the pool or they might be views from the pool itself out across a panorama in the outside landscape or to a feature within your property. If you are in search of ‘the natural look’ to the landscaping around your swimming pool, then using local materials will probably be the best solution. Boulders and large pieces of rock will look dramatic and give your design a sense of scale. Wherever you live in the country, there is almost always a local quarry that can provide something suitable. With large pieces of stone, transport and access is usually the limiting factor to what can be brought on to site and used in your design. Your pool will need an area of decking around it and if that is laid in slabs of the same local stone then colours and textures will start to match and bring the design into a cohesive whole. 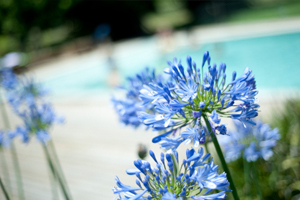 Not all the water in your landscaping design needs be part of the pool or spa system. A simple re-circulating pump could drive a small waterfall or a rill or stream that appeared to be a part of the free-form pool but needn’t be treated and, in turn, wouldn’t affect the water in your pool. When it comes to planting, then personal choice and taste probably plays more of a part than anything else however, for the natural look then choose a restricted palette of plants – perhaps 5 or 6 – and go for ‘drift planting’ which most closely replicates how plants will self-propagate and grow in the wild. Swimming pools are relatively large and at least some of the planting around them needs to have a similar sense of scale. Gunnera Manicata – which resembles giant rhubarb – is dramatic, thrives near water and can produce leaves big enough for a grown man to walk under. Miscanthus comes in various forms and is a variety of grass that will grow over 7ft tall. Bamboo can be used to create screens and Musa Basjoo is a form of banana producing beautiful, architectural leaves that is relatively hardy and can grow to over 12ft even in Britain. None of these plants will shed leaves into your pool in the way that deciduous trees will. They – and of course many, many others – will give your landscaping an appropriate sense of drama. There are many other ways to landscape around a pool other than taking a naturalistic approach and we will be looking at them in other articles. We hope this particular article has been of interest and of use to you. If you would like to add to this article or comment on it then please use the reply box below.